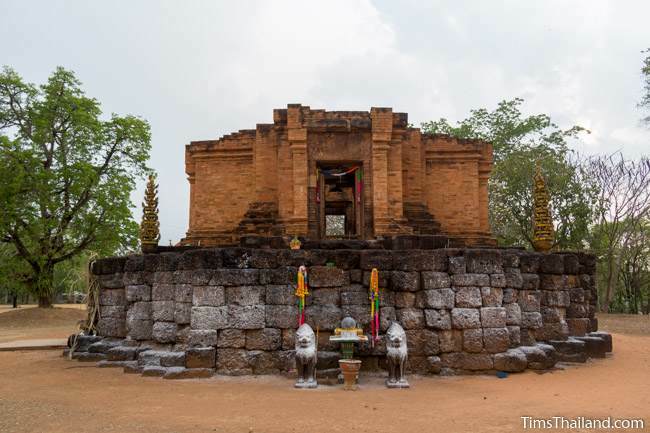 Ku Daeng (กู่แดง) is a single brick prang with a rather unusual design: it's cross-shaped with open doorways on all four sides and has a nearly three-meter tall base. The prang collapsed completely, but the laterite base, with stairs on all four sides and deeply redented corners, survived mostly intact. 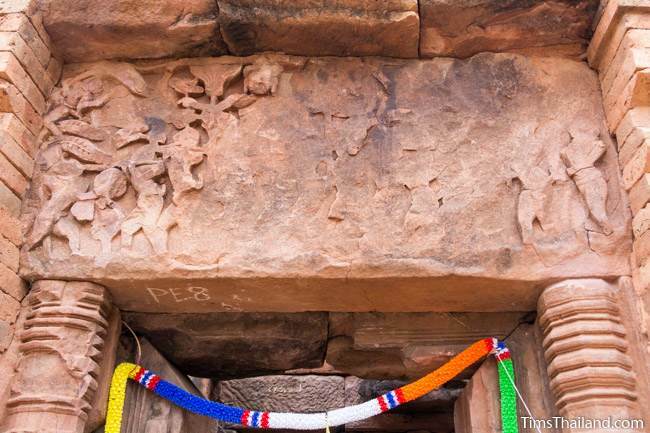 The base's modern modification is that locals filled in the eastern steps to make a solid wall as a spot for making offerings. 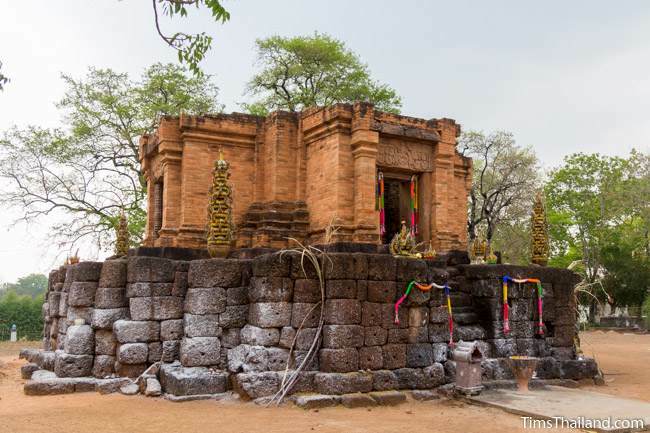 In the Khmer era, the east was the temple's front side. 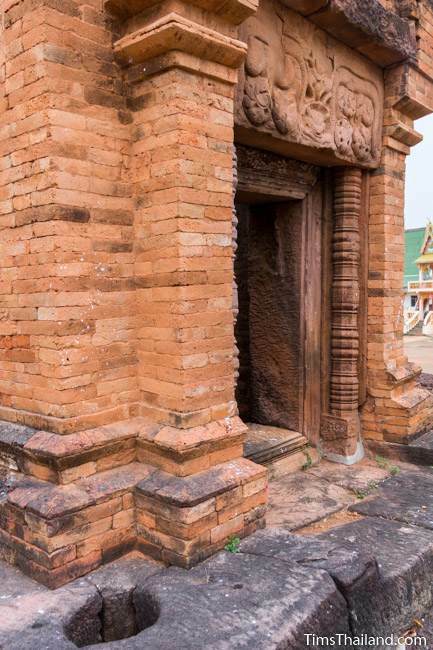 Up until 2016, all that remained atop the base were the sandstone door frames and colonettes (along with a modern Buddha image and a large tree that had taken root), but the ground-floor level of the tower has since been rebuilt. The bricks are mostly new; only the few noticeably darker colored bricks are originals recovered on site. Each doorway has a small chamber, which creates the cross shape, and post holes next to the doors indicate that there were probably roofs in front of them. There is no sign saying so, but the monks prefer that women do not climb up. There are six lintels here; though really it's just four and a half since the interior east lintel is broken and the one over the outer north door is uncarved. The lintels' style of art (Baphuon) indicates that Ku Daeng was built as a Hindu shrine in the late 11th century, though there is no inscription to confirm this, so it could have been a bit later since in Thailand's Isan region, older styles of art sometimes continued to be used after new ones were adopted back in the Angkorian heartland. Also, note that having Vishnu and Krishna (an avatar of Vishnu) carvings does not mean the temple was dedicated to him. It was probably built for Shiva, but since the interior statuary is gone there's no way to know. 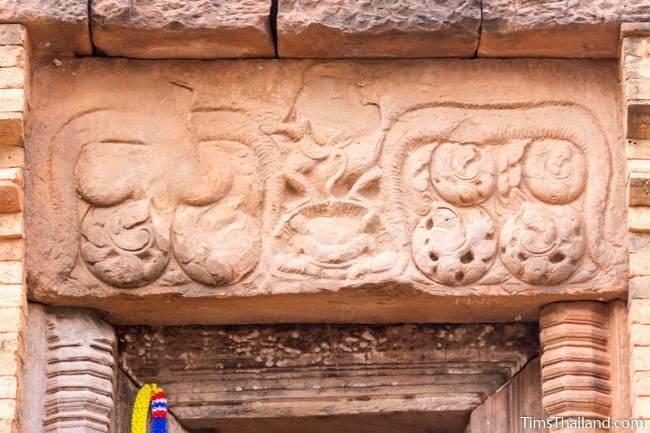 South exterior lintel – Krishna fighting a singha and an elephant. South interior lintel – The Churning the Ocean of Milk story. 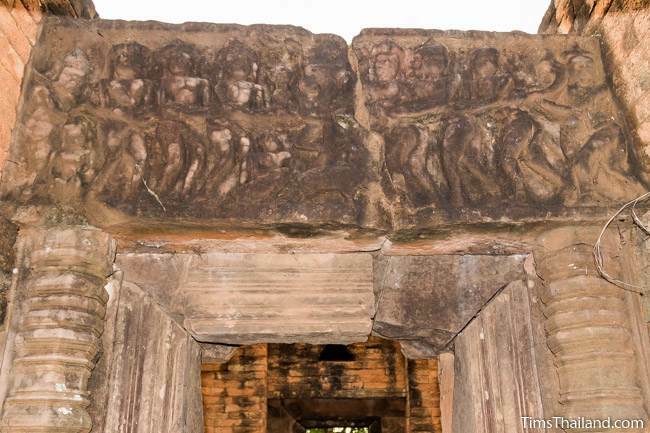 East exterior lintel – The figures on the sides are monkeys, which means this is probably a scene from the Ramayana and the head at the top would be Rama. 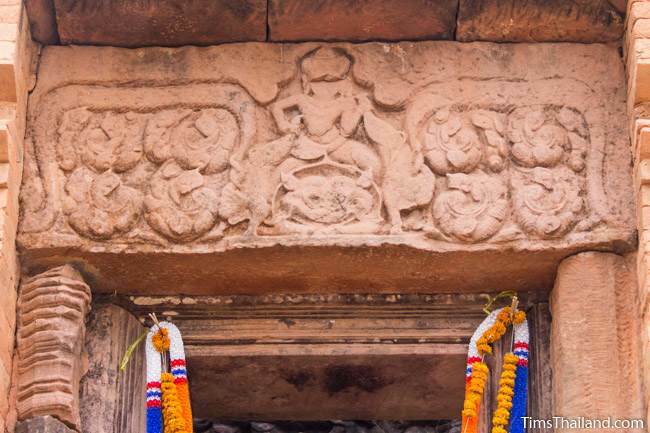 East interior lintel – The Hindu creation myth. Vishnu reclining on the Ocean of Milk with a lotus growing from his navel on which Brahma is being born. He is reclining on a dragon and his consort, Lakshmi, at his feet. 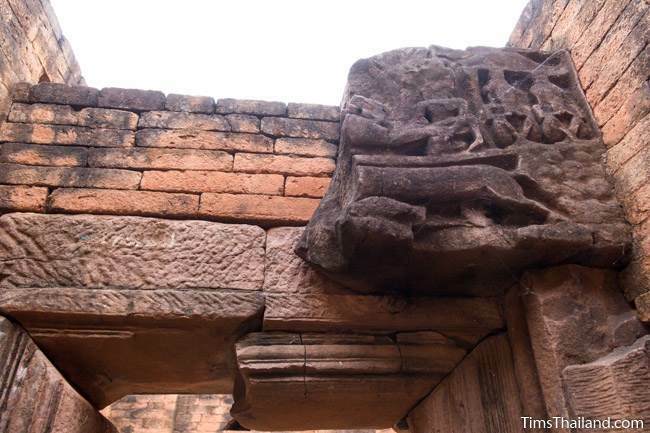 West exterior lintel – It's too damaged to be sure, but this is probably also Krishna fighting an animal. There are no remnants of any other structures, nor of a moat or baray. But, what may have been the quarry can be seen on the far east edge of the temple grounds, next to a rice paddy, and in front of the Rama V statue. 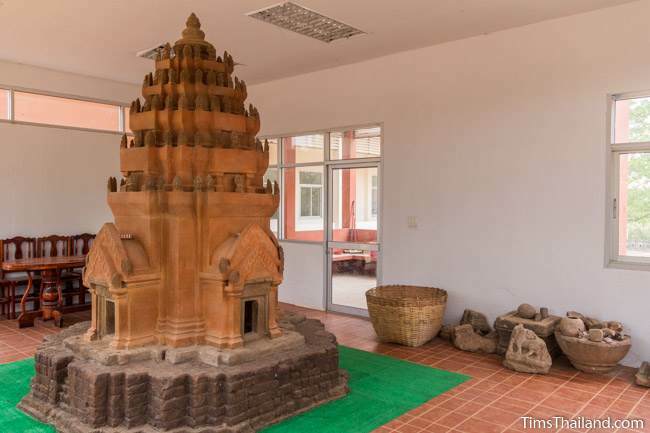 There are no full sandstone blocks hacked out and waiting for extraction, as can be seen at other Khmer quarries in Thailand, but a few shallow cuttings to begin the process are clearly visible. Also to the east, in the exposed bedrock next to the temple gate, are 29 holes of irregular diameter, various depths, and no obvious pattern. The monks here have no theories to their origin or purpose, but do believe that they're ancient. 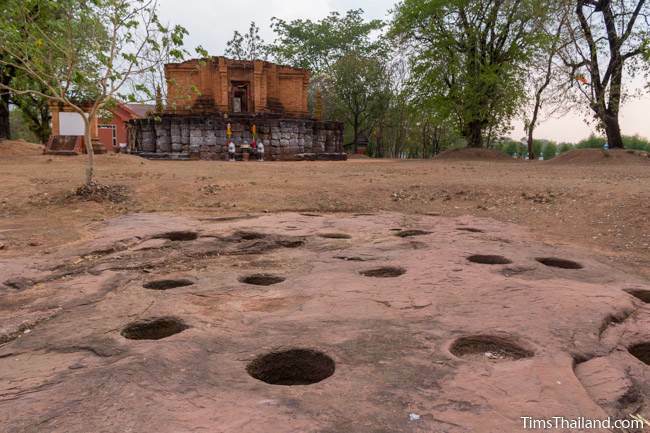 Next to the holes are a few old sandstone and laterite blocks not used in the restoration. One room in the unmarked beige and brown building just west of the prang has a little "museum" with a big model of how the completed tower could have looked. 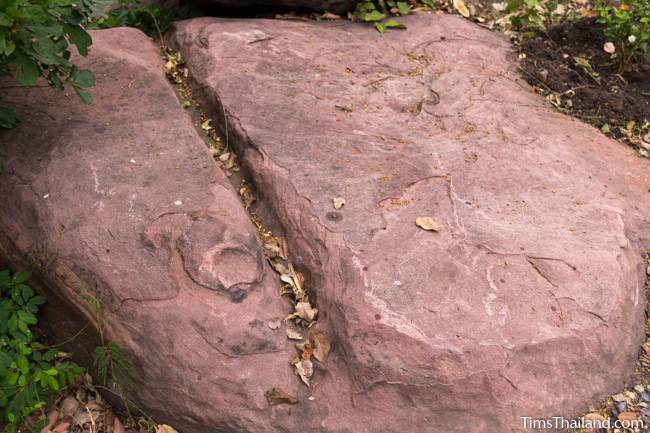 There's also a pedestal, some pottery, and a fragments of sandstone carvings, including one of a horse.